Regarding the time dimension, there are two main options - sprint (aka iteration, timebox) or flow. This choice is often coupled with the choice of implementing Scrum vs. Kanban, respectively. 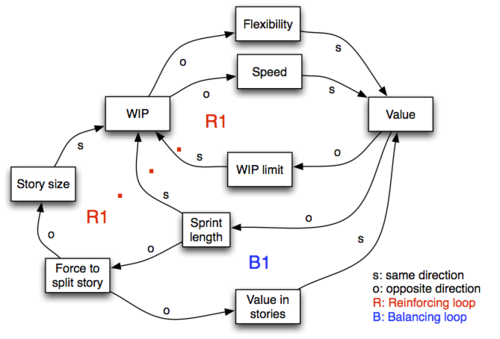 However, in this article, we do not try to compare Scrum vs. Kanban, but only sprint vs. flow. We focus on seeing the system dynamic around its impact on value delivery and continuous improvement. We aim to maximize the value delivery, and the key is to reduce WIP regardless of whether to use sprint or flow. The below CLD illustrates the dynamic around this. There are actually many R1-loops. As their essence is the same, I put them under same label. the more "use of same ways to reduce WIP"
Then, there are various ways to reduce WIP. Sprint creates force to split the story, as it is required to complete the story at the end of timebox. When story size is smaller, it reduces WIP further. This contributes to the virtuous cycle. However, too much force will make the story splitting unnatural, thus, decrease the value in those split stories. This forms B1-loop. The story could not be split infinitely, as there is natural limit on how small a valuable story could be. If you look at R1-loop and B1-loop together, it is actually a typical "limits to growth" system archetype. Eventually, growth process hits the limit. In reality, there are many other limits. I choose to illustrate this one as it relates to the common accusation for timebox approach. We aim for continuous improvement, and the key is to create the right amount of challenge to drive improvement, regardless of whether to use sprint or flow. The below CLD illustrates the dynamic around this. The R3-loop illustrates the unintended consequence when the challenge is too big. 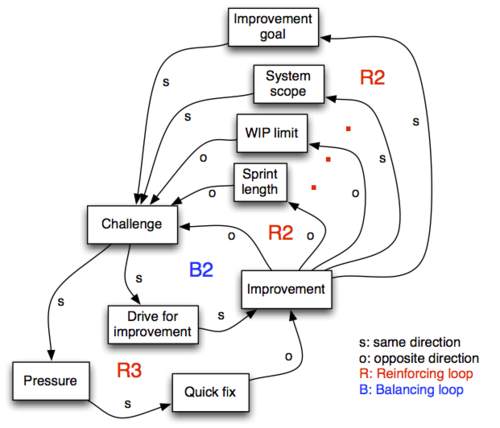 You may think of B2-loop and R3-loop together as "fixes that backfire" system archetype. In essence, it explains that having right amount of challenge matters. Then, there are various ways to elevate goals. We have seen its role in maximizing value delivery, here comes another important role limiting WIP plays, which is for continuous improvement. In Scrum, this means extending Done. In LeSS, this means extending Done, expanding product definition, or both. In Kanban, this means expanding the scope of Kanban system. When system scope is expanded, the challenge increases, which creates drive for continuous improvement. The above is essentially all various ways to elevate improvement goals. 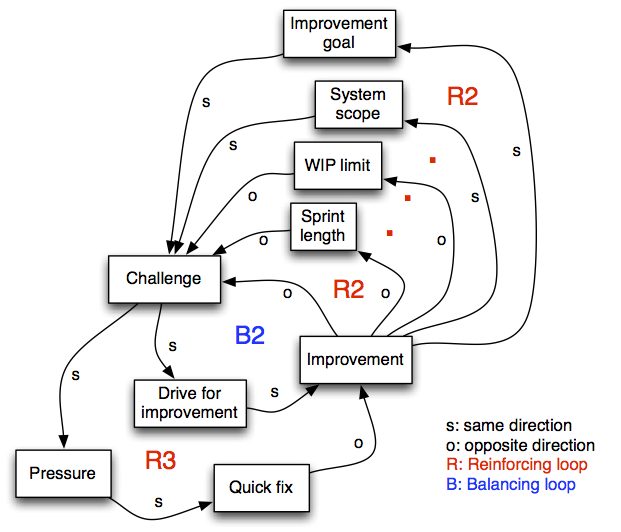 Besides, making it flow and shortening cycle time is probably the most important goal in Kanban. See more in my article about improvement goal. 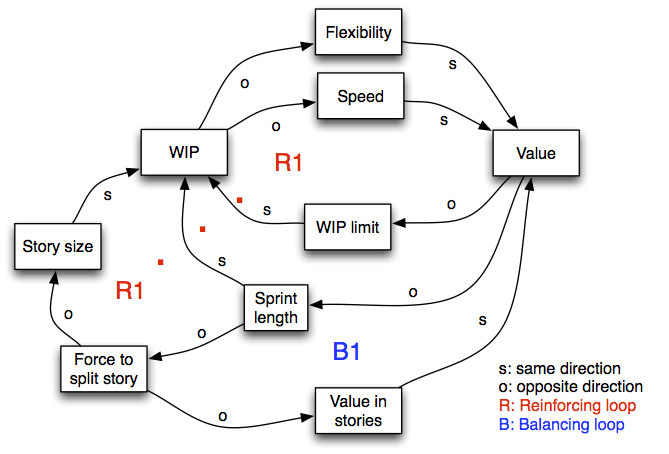 With the choice of sprint vs. flow, they essentially use different ways to reduce WIP, while low WIP helps for both value delivery and continuous improvement. This page contains a single entry by Lv Yi published on January 26, 2017 10:53 AM. Seeing the system dynamic: coordination role vs. self-organization was the previous entry in this blog. Paradox in coaching self-organizing team is the next entry in this blog.